In master engraver George A. Walker’s newest work, The Mysterious Death of Tom Thomson, the circumstances surrounding the death and disappearance of the iconic Canadian artist are explored through some one hundred and nine wood engravings, creating a work that eulogizes not only the artist himself, but the struggle of the artist’s attempt to express himself while constrained by society, the reality of the moment, and mortality. Walker’s engravings in The Mysterious Death of Tom Thomson pay homage to Thomson’s contribution to Canadian culture through both representations of his own life and of the contemporary artistic community as a whole. The German Expressionists, who were active around the time Thomson was painting, often used wood engraving techniques in their own works. 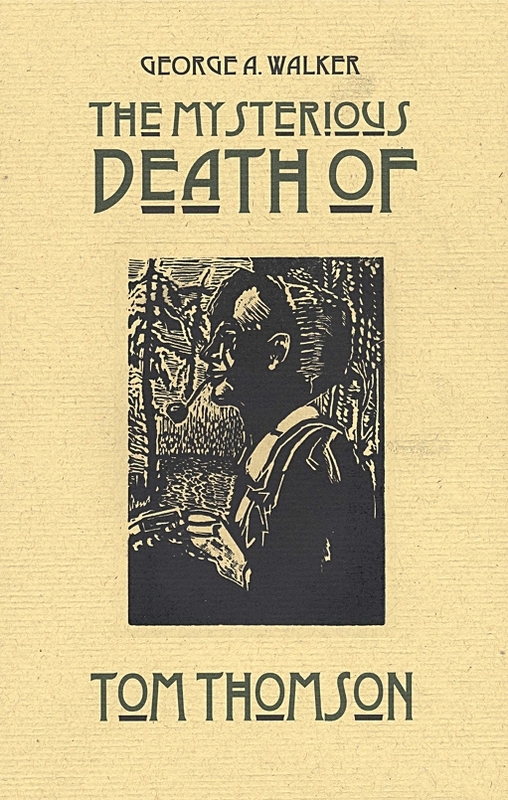 A ‘‘wordless novel’’ format captures the essence of Tom Thomson’s artistic spirit and iconic story in an apt way—not only acknowledging the global community of artists of which he was a part, but also alluding to the multiply-interpreted circumstances of his life and death in ways that a text-based work could not. In this wordless experiment in woodcuts, textual content is lost, yet emotional content and a sense of pure, voyeuristic mood are gained. 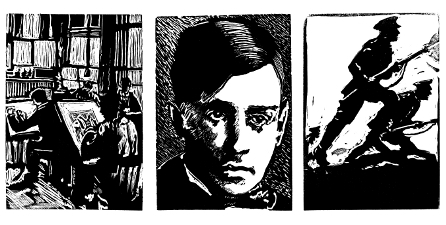 Acclaimed woodcut artist George A. Walker uses a wordless chain of images to tell the story of the life—and still-unsolved death—of a Canadian artist in The Mysterious Death of Tom Thomson. Thomson was an up-and-coming painter when he turned up dead near Canoe Lake in Algonquin Park, Ontario, in 1917. His death has been imagined or referenced in several works of fiction, poetry, and music over the years, with many theories proliferating on exactly how he died. A swimming accident, suicide, and murder have all taken turns as favored theories, and Walker chooses the latter for his version of events. Despite the title of the book, Walker is not only focused on Thomson’s death, but instead uses a balanced approach in his 109 engravings, depicting images across Thomson’s entire life. This gives a sense of who Thomson was—a developing artist, still discovering who he was—and makes his premature demise that much more tragic. Walker places a woodcut on every right-hand page, preceded by a blank page on the left, which allows each image to make its impression felt without competition. Without any guiding text, images can be lingered upon or quickly breezed past, but Walker exerts some control by including a telling detail that might demand closer examination, such as the repetition of an image on an army recruitment poster, or by the sudden, unexpected, and arresting explosion of anger and violence that accompanies Thomson’s death. Walker’s woodcuts communicate Thomson’s sense of peace in nature, especially as contrasted with those images of the developing cities of Ontario: a locomotive at a station, for example, versus a later image of Thomson alone, carrying a canoe on his back. By necessity, some information is lost in Walker’s wordless experiment—it’s sometimes hard to tell exactly what’s happening in a given woodcut, or how it relates to the continuing narrative, and there’s no way to completely grasp the cause of the argument that ends Thomson’s life. But if literal, textual content is lost, emotional content and a sense of pure, voyeuristic mood are gained. If the overall track of Thomson’s life seems unclear from one image, the next usually puts it in context and serves to clarify. The Mysterious Death of Tom Thomson makes demands, and those unwilling or unable to participate fully may find Walker’s efforts not to their taste. 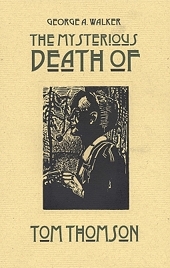 But the uncertainty about the circumstances of Thomson’s death matches the uncertain element of reader interpretation of the images; an indication, perhaps, that Walker’s subject is uniquely well-suited to his wordless treatment. ‘The circumstances that surround the death and disappearance of Canadian landscape painter Tom Thomson are still unknown. Just as interesting as his mysterious death is the life of artistry that he lead. ‘Mystery, haunting images, strong emotions, one Canadian artist’s tribute to another—there’s much of interest in this book. One thing you won’t find, however, is a lot of text. The artist who created the book, George Walker, calls it a "wordless narrative", and he uses only pictures to tell the story of Tom Thomson’s untimely death in 1917. We all ‘read’ a vast array of images that present themselves to our attention daily. Our world is filled with signs and symbols. Our distant ancestors once read the stars as a compass, and we still study the sky to forecast weather. The surface of the ground at our feet can alert an experienced tracker as to just who or what might be prowling in the vicinity. The earliest cave paintings were inspired by the interactions between humans, animals and the world they shared. These sorts of natural signs and signifiers provided the basis for what would eventually become a multitude of written languages. Our essential need to preserve and to communicate our stories has evolved into a complex system of writing that is rooted in the simplicity of the pictogram. Presented thoughtfully, pictures can still convey information, evoke pleasure or warning, influence behavior and, most importantly, tell a story. The Mysterious Death of Tom Thomson is the second of my wordless narratives, based on original hand-printed limited editions, to be published by the Porcupine’s Quill. In it I tell the story of Canadian painter and cultural icon Tom Thomson (1877--1917). There is no shortage of art historians who recognize Thomson as a key influence on the Group of Seven, founded in 1919, and instrumental in the shift of Canadian Art towards modernism. Most Canadians, however, know of him from the enduring mythology surrounding his short life and the curious circumstances of his death. It has often intrigued me that Thomson chose to avoid so-called ‘reality’ in his painting; though, admittedly, a clearly art-nouveau mechanical approach does appear in the commercial work that he produced for the Grip design firm in Toronto. Canada was undergoing dramatic changes during Thomson’s lifetime, and the artist found himself working in the midst of an industrial landscape cluttered with machines and booming population growth -- all coloured by the mounting tensions that would lead to the First World War. Rather than document the grim realities of industrialization, Thomson set out to discover and depict the untamed wilderness of Northern Ontario. Through Thomson’s impressionistic style, the paintings from this period communicate at once both the harshness of the Canadian landscape as well as Thomson’s steadfast love of the land, now threatened by the rise of industrialization. It was Thomson’s relentless search for the definitive landscape that could accurately express an emotionally-charged wilderness that appeals most to us in his legacy. I hope it is deemed appropriate that such an artist, who rarely wrote a word but painted and sketched hundreds of images, will have his story retold in the language he understood best: the language of pictures. As images supply the means of communication in this book, an understanding of the process of engraving is critical to an appreciation of the medium. I tell the story of The Mysterious Death of Tom Thompson through one hundred and nine wood engravings, carved into handmade blocks of wood. Wood engraving and woodcut were techniques favored by the German Expressionists, many of whom were active around the time Thomson was painting. Though Thomson himself seems to have expressed little interest in art theory, his paintings clarify that he did hold some of the same beliefs as the Expressionists who sought to articulate emotional meaning through a primal response in their art. In addition to the obvious connection between Thomson and wood engraving, all of the images in this biography were carved into blocks I manufactured myself from Canadian maple. Much like Thomson’s own landscapes of choice, wood is an organic material that retains its idiosyncrasies which speak out to the artist through knots and anomalies buried deep in the block’s rings of time. The tree I used to make the blocks was very likely alive when Thomson was painting in Algonquin Park where part of this story is set. To strengthen the connection between the story of Thomson and the medium used to tell it, my friend Tom Smart presented me with some decaying branches that he believes fell from the trees Thomson painted in Byng Inlet. I took these branches and fashioned them into the block that I used to make the last image in the book. For myself I believe the body of Tom Thomson still rests at Canoe Lake, and it is also my opinion that the true story of the Tom Thomson tragedy may never be known. Thomson lived, painted, loved and died under a veil of mystery and to this day, stories of Thomson’s ghost still circulate in Algonquin Park. What does remain of Thomson now is a potent body of work that defines a moment in time and one man’s vivid engagement with nature. My hope is that I have succeeded in communicating some of the same passion in my visual narrative that Thomson achieved in paintings such as The Jack Pine and The West Wind. When his body was discovered in a lake in the Algonquin Park wilderness in July 1917, Tom Thomson had been missing for eight days. He disappeared while canoeing. Although the official cause of death was accidental drowning, how he actually died is a mystery even though it was reported that the corpse had fishing line wrapped around a leg and the head showed evidence of trauma. Speculation abounds either that a neighbour, Martin Blecher, Jr., murdered him, or that he fell during a drunken brawl with J. Shannon Fraser, over an unpaid loan to Fraser for the purchase of canoes. Thomson is said to have needed the money for a new suit to wear for his marriage to Winnifred Trainor, whose parents had a cottage near where Thomson was staying in the park. Rumours circulated following the death that she was pregnant with Thomson’s child. Neither of these theories was ever proven, and the wide range of speculation serves only to perpetuate the Thomson myth. The Mysterious Death of Tom Thomson re-imagines in some one hundred wood engravings the events leading up to Thomson’s tragic death and the discovery of his body. It explores the themes of death and the realization that, in spite of even the greatest achievements, a human is nonetheless powerless against it. The narrative is a visual elegy reflecting on the loss of a gifted artist and a man of his time fluent in the visual language of modernism, who also found solace and an artistic muse in the wilds of the Canadian bush. George Walker’s engravings chart his life, relationships and journeys as he made a living as a commercial artist in early twentieth-century Toronto, and a painter who found creative inspiration in the hinterland of lakes and forests. As Walker conceives it, this book also translates in a purely visual language one of the earliest known works of literature, the Epic of Gilgamesh, about an ancient king and master builder, named Gilgamesh. A story told in two parts, the first revolves around the relationship between Gilgamesh and Enkidu, a wild man created by the gods as Gilgamesh’s equal. Enkidu was an innocent savage, content to live among the beasts until a trapper tamed him. Through his friendship with Enkidu, Gilgamesh learns much about what it is to be human. He experiences love and compassion, as well as death and loss. As Enkidu rages against his own death, he fights to live. His distress at his impending death is appeased by the sun god who assures him that he will be remembered after he passes on. The second part of the epic, focusing on Gilgamesh’s sorrow over Enkidu’s death, takes the form of a quest for immortality. He grieves heavily over the loss of his friend and vows to find the key to everlasting life. So, he sets out on his own journey through the underworld to learn the secret of everlasting life. This ancient story about finding redemption in death is ultimately about the meaning of remembrance, and is also a parable of artistic creation. Expressed metaphorically, the epic advocates the reconciliation of the dual nature of the artist hero -- his sensibilities as a man of his time and builder of cities, with his natural self, personified by Enkidu. On his journey, Gilgamesh must find ways to express creatively his tremendous personal energy, but still act in a manner that accords with the limits and responsibilities imposed upon him by his society and universe. These are the same obligations that face Walker’s hero, Tom Thomson. 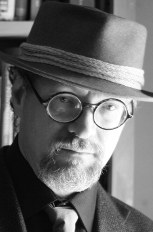 Walker’s Thomson is a modern-day Gilgamesh. In the wordless, pictographic narrative, Walker describes the struggles and accomplishments of his artist protagonist. Like Gilgamesh, Thomson must also come to terms with the gifts and talents that are his alone, and to live out his vocation in both the city and the wilderness against the background of war. This is a narrative constructed around a man and his search for meaning by experiencing nature. Thomson rejects the modernism of the city, its industry and commerce, in order to find his destiny in the hinterland. There is an even larger narrative that enfolds the book that you have in your hands. It is a story that includes George Walker, an artist and wood engraver, coming to terms with the death of his own artistic double and Enkidu-figure: Tom Thomson. This book charts our author’s realization that he too must learn about death and tell the tale as art to instruct all of us. Gilgamesh is told that since immortality is for the gods alone, he should find joy in life and to live a life worth remembering. While everlasting life is not his destiny, Gilgamesh is instructed to leave behind him a name and also the fruits of his creativity -- buildings and stories -- that will endure. ‘‘I will go to the country where the cedar is felled,’’ he tells Enkidu. Thus, he turns his attention away from small personal desires to loftier aims -- desires that benefit rather than harm. This is the same morality tale that Walker tells us in his suite of engravings. In The Mysterious Death of Tom Thomson, the hero embodies qualities of both Gilgamesh and Enkidu. Walker’s mystery teaches us what it means to be human and mortal. It also tells of the power of art to be a living witness of the true stories that are drawn from a deep well of experience and myth that unite humankind.